Request a New Orleans Bachelorette Party here. Come get your flower party on with us on your trip to New Orleans. We are a flower party business where we have flower party hostess's in cities around the US. We typically work with bachelorette parties, ladies weekends, ladies night out, bridal showers, baby showers, weddings, etc for our flower crown parties. We come to your hotel or airbnb in New Olreans and we setup a flower crown workshop for you and your bachelorette party. Think all the flowers, rose and fun for a unique bachelorette activity on your bachelorette weekend. Inquire on the form to the left for more information on hosting a New Orleans flower crown party with Fetes de Fleurs New Orleans! Can't wait to flower party with you here on your New Orleans Bachelorette Party! What a fantastic place to host a bachelorette party! We think New Orleans is a great place to go for the weekend for your bachelorette party. It has everything you need- good weather, beauty, DRINKS, food and well, more drinks! 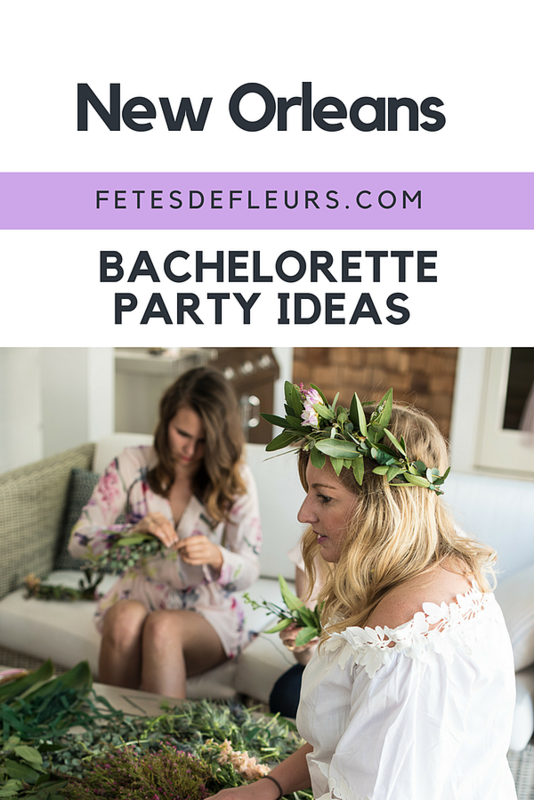 So let's help you get started on your New Orleans bachelorette party planning with some of our favorite floral theme party ideas to help you complete your bachelorette party weekend in true floral style. New Orleans has some of the most chic hotels with the hottest bars. We've come up with a list for you NOLA Bachelorette Babes trying to plan your perfect getaway. Whether you're willing to splurge or keep the cost down, here are some great options for planning your New Orleans bachelorette party weekend. 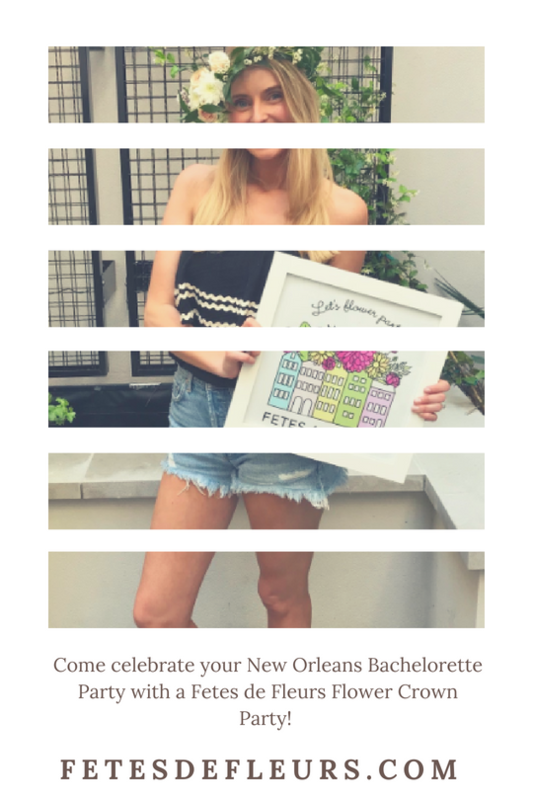 Coming to New Orleans to celebrate your bachelorette party? You've come to the right place! It's no wonder the New York Times voted New Orleans it's top place to visit in 2018. With some of the top music venues, restaurants, and night life who wouldn't want to celebrate in the Big Easy? Here we know how to party, get down, and Laissez les bons temps rouler "let the good times roll". After all we throw the biggest party in America: MARDI GRAS! So your boyfriend finally popped the question!!! CONGRATS GIRL! Or maybe you are helping your bestie plan her bachelorette party weekend. Don't you have the best job ever? You party planner you, you are in the right spot! You come up with a list of some fun destinations for a bachelorette party weekend. New Orleans has to be on that list. New Orleans has so much to offer for a weekend getaway. Add a bachelorette party to the weekend mix and you have yourself a doozie of a weekend ahead of you. Fetes de Fleurs is pumped to have a flower party hostess in New Orleans for New Orleans bachelorette parties. 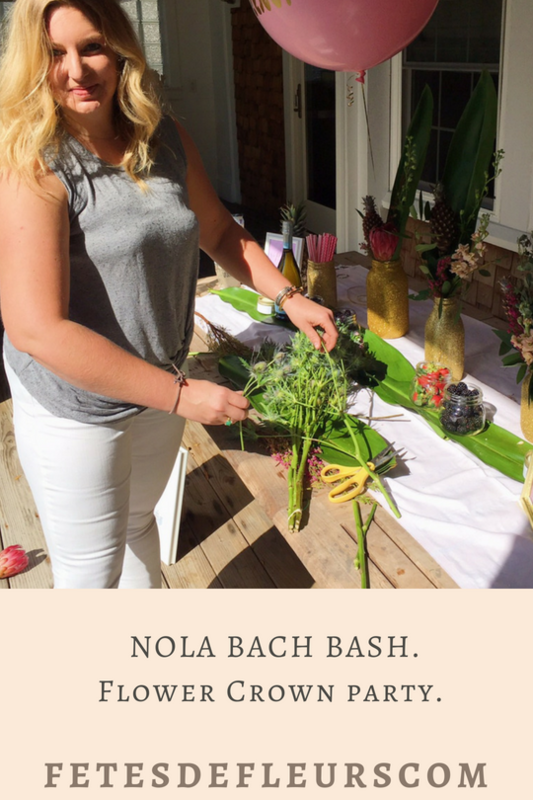 We wanted to give you some insight into some of our floral themed packages that you can incorporate into your NOLA bach bash! We know you want to get your drink on here in New Orleans for your bach bash but we also want to provide you with some memorable bachelorette activities that you will, WELL, REMEMBER :) So here are some fun, girly, chic bachelorette party activities that you can do on your New Orleans Bachelorette party weekend. WELCOME TO THE FLOWER CROWN PARTY!